We are honored to invite the artist Marine Hugonnier to have a dialogue with Larys Frogier, the Director of Rockbund Art Museum and the co-curator of “Walking on the Fade Out Lines”. The conversation between the artist and the curator will lead us to behind-the-scene stories of the artwork as well as the practice of the artist. Through the discussion based on the artwork, we hope to discuss when the artist sees photography as an experience, when the camera lens is an extension of the artist’s eye or subjectivity, how the “failure” of the photography attempts actually made it possible for the artists to question the original meaning of viewing. The film details artist’s travel to Afghanistan in the summer of 2002. The artist, set out with her companions, seeks to reach the Pandjsher Valley, located in the northeast of the country; however, Afghan authorities deny access to the area due to its strategic value: filming this landscape becomes a way of controlling it. Although Hugonnier finally obtains permission to reach a TV hill overlooking Kabul, she chooses to turn the eye of her movie camera elsewhere. This film investigates the relationship between landscape and history, and shows how our perception is always influenced by political and cultural preconception. The film takes place in an imaginary future in which natural sites are closed to the public in order to preserve them from mass tourism. As the title says, the spectator is invited to take a last tour of the Matterhorn National Park in Switzerland, both overland and on a balloon. In this film, the editing juxtaposes shots of the Swiss mountains with those of Disneyland's roller coaster, which is curiously called Matterhorn. In today's experience of tourism, the landscape always offers itself as a pre-built image, as something that is difficult to avoid, and the feeling of a déjà-vu is common even in the most exotic situations. The Trans-Amazon Highway was a huge road network project which aimed to connect the whole territory of Brazil from east to west. The construction begun in the 1970s under the military dictatorship and was left unfinished. 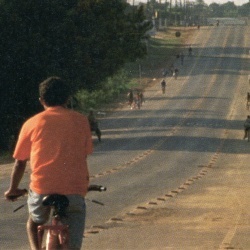 The film documents the artist's attempt at making a tracking shot along a specific point of the road, with the help of local workers and by resorting to the same materials that were used at that time. 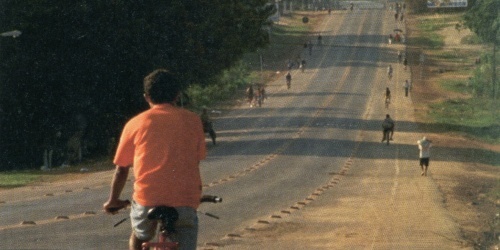 In the camera shoot, the process of rail building alternates with the voices of several inhabitants expressing their point of view on the Trans-Amazon. These three works constitute a film trilogy—shot in Afghanistan, in the Swiss Alps and in Brazil—devoted to the anthropology of images and ways of seeing. Marine Hugonnier, is a Franco-British filmmaker and artist. She lives and works in London (United Kingdom). Informed by her academic background in philosophy and anthropology, Marine Hugonnier's films explore the "politics of vision", referring to a belief that images are inextricably bound to the historical, social and cultural legacies. Weaving history, geography and narrative her works (films, work on paper, sculptures and photography) helps us understand how our perception is influenced by pre-existing political and cultural conditions.